The geology and earth history along this section of the Australian coast is one of violent upheaval and seismic change stretching back 490 million years. Yes, it does now. But the history of the earth is long, and all you need to do is scratch beneath the surface and that story begins to reveal itself. 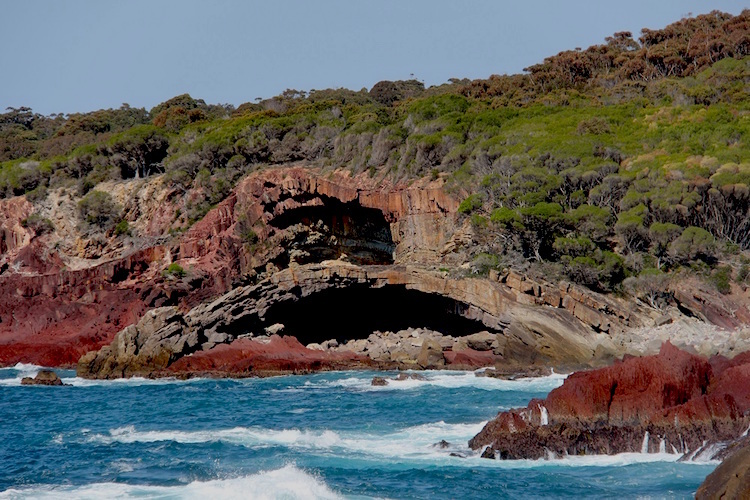 Australia’s Coastal Wilderness includes the oldest rocks in eastern Australia, and fossil records of some of the world’s earliest land animals, forests and ancient fishes. By Middle and Late Devonian time (390 – 350 million years ago), this southeastern part of Australia was part of the pre-Gondwanan supercontinent, Pangea, that incorporated almost all of the landmasses on earth. Massive. As the continental crust of Pangea began to stretch and thin in response to shifts in the tectonic plates, a period of volcanic activity began, much of it happening near present day Eden. Hot rock exploded through the thinned crust. Thick ignimbrite sheets covered the landscape. Parts of this area resembled the active volcanic region of Yellowstone in northwestern United States. The volcanic activity left a geological mark that is a distinctive feature of the region. 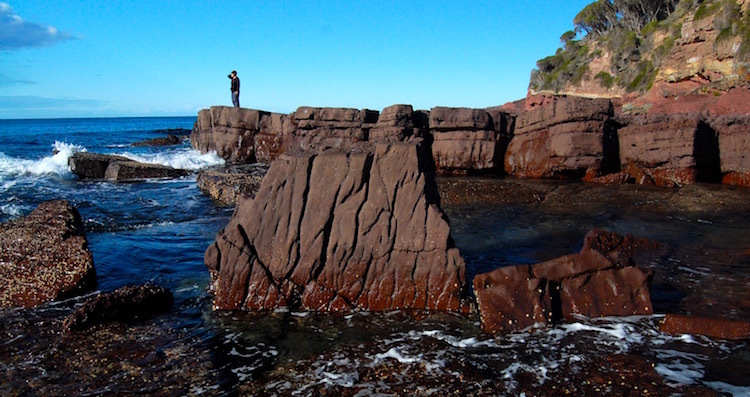 At Eden, the shoreline around the wharf at Snug Cove and the lookout on the headland in the heart of Twofold Bay are places to see volcanic features. The headland is made of hard, erosion-resistant volcanic rock. Across from the lookout stands the white pole of the ‘lighthouse’ leading the way to Snug Cove. Below the light- house, the massive cliff is formed from ignimbrite. As seen from the lookout, the cliff provides a clear cross-section view of a couple of separate ignimbrite flows, each the result of new volcanic eruptions. The flows were not liquid lava flows, but clouds of sticky ash particles, so charged with gases that they flowed like water. These glowing ash clouds flowed over the landscape, gradually losing gas and cooling until they became the consistency of toothpaste. Bubbles of gas became ‘frozen’ in this sticky rock as it finally set solid. Some fossil bubbles, now filled with soft greenish clay minerals, can be seen embedded in the solid rock at the back of Cobbly Beach, on the western side of Snug Cove. The Light to Light Walk passes over red mudstone and sediment discharged here 360 million years ago by rivers the size of the Mississippi that traversed Australia’s ancient red deserts on their way to the ocean. These rivers were home to fierce armoured predatory fishes, whose bodies are preserved in former billabongs. Here and there, on rock platforms, the scattered remains of the plate armour of these fishes can be seen. Rarely, entire corpses of these fishes are preserved where they died, trapped in drying billabongs and rapidly buried by sediment carried by the next flood. Casts of some of these ancient fishes are displayed at the Eden Killer Whale Museum. Not only is our coastline a happy hunting ground for fossil fish researchers, but it has yielded species new to science, making it a world-class fossil fish site. In 2008, researchers uncovered the fossilized remains of an extinct armoured fish from a piece of 360 million-year-old rock near Eden. Named the Edenopteron, this huge-fanged fish would have been more than 3 metres long! A former editor of the local paper, Jake Lynch left Eden in 2006 to follow his heart, and general sense of adventure, across the United States to work for recreation and community development nonprofits. 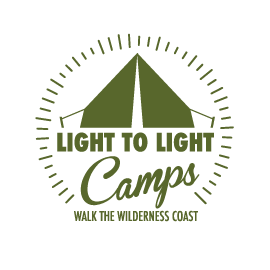 But some opportunities are just too good to pass up, and he was very easily lured back to join the Light to Light Camps team in 2016.